Pocket Artist delivers the powerful features you'd expect from desktop image editing software in an easy-to-use artistic tool for Windows CE compatible devices. With Conduits Pocket Artist, you can edit and retouch photos and images, add text and special effects, create web graphics, and much more. 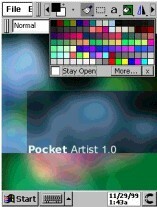 This download is the free trial version of Pocket Artist. The full version can be purchased directly from the author for around $49.95 USD. See program documentation for details.